This was a magical workshop on a most beautiful Greek Island which i created in conjunction with Skopelos Foundation for the Arts and Omega Travel. Visiting "Greek workshop" & Prelude GALLERIES for Great Images "Mia Muse" images. Read we.love.crete.com blog - here! "Suzy Birstein embraces the history and culture of the tiny Island of Skopelos Greece as she takes great care in ensuring her students experience all there is to see and do in this uniquely beautiful setting. Studying clay sculpture and surface decoration with this wonderful artist in such beautiful surroundings facilitated not only a creatively inspiring experience, but also a restoration of mind and spirit. I have come away with an understanding and love of Greek art, Skopelos Island and Suzy. It was an experience I shall cherish forever. " "I cannot speak too highly of my experience with Suzy's ceramics course on Skopelos Island. Working with clay in that magical setting overlooking the turquoise Aegean Sea was one of the highlights of my artistic life. The people of Skopelos are welcoming and hospitable. Your MUSE AWAITS YOU on the green island. Feel free to e-mail me for more enthusiastic information." "Mia Muse": What's not to LOVE!? From the stunning setting on the Greek Isle of Skopelos to the food, people, villa, cats and local shops. 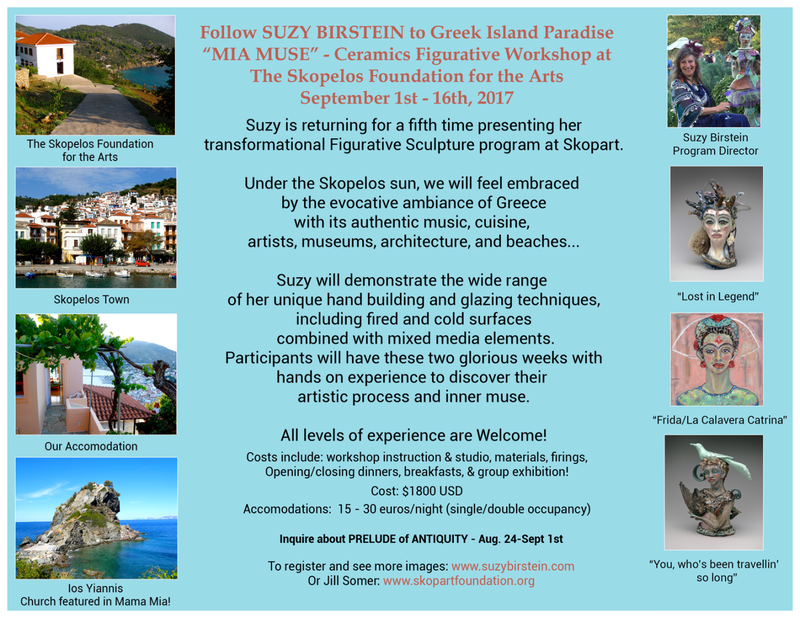 I will always cherish this experience with vibrant, fun and skilled artist, Suzy Birstein, in her Ceramic Sculpture workshop at Jill and Gloria’s magnificent Skopelos Foundation of the Arts!!!" "Never been to Greece ... never worked with clay. Yikes! BUT....... travelling with Suzy and beholding the wonders of Athens & Delphi before we started the workshop was an amazing experience. And just when I thought I couldn't be amazed any more we arrived in Skopelos. For two weeks we became Greek residents, the accommodations, food, people & art academy were incredible. I am an artist who works on canvas but with Suzy's direction my inner muse created some pretty awesome clay pieces. Can't wait to go back in September 2013!" "Suzy's approach to teaching and creativity is rooted in a generous spirit, an uncanny perception of individuals, a joy of life, and a sense of humour that has made for an excellent workshop, and a release of freedom ofexpression for all involved. We have been given the tools, and thepermission to express what we deem important, without the fear of being"found out" or laughed at and are free to be comfortable with ourvulnerabilities, and feel the power of our desires. There were noheirarchies, no belittling because of inexperience, no power strugglesbetween Art and Craft. I saw participants soaring and making realbreak-throughs in their thought processes because Suzy gave them theconfidence to not worry about the craft, but find the solution to illustratetheir desires. Suzy may be "too-cute" on the outside, but she is centredwith a steel rod on the inside, an endless energy, and a source ofinspiration."